This card is for the SCS Sketch Challenge 200. 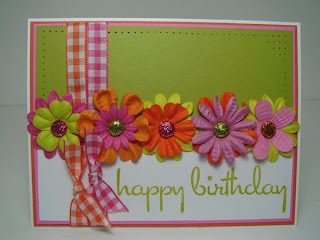 I need a birthday card and this layout worked well for this girlie card. It's larger than I usually do to make the little handbags fit. I got the idea for the handbags on Laura Frederickson's blog, Scrapnextras. Aren't they the cutest little things?! Laura gives great directions for making them with the Round Tab punch here. I did them pretty much exactly the way she did and they turned out so cute!!! Anyway, my base card is Whisper white with a layer of Basic Black. The next layer is part Whisper White and part DP from Basic Grey's Urban Prairie 6 x 6 pad. Is this not gorgeous paper???!!! I just love it. I got it from Jacksonbelle Embellishments. Check it out. Lindsey has a wonderful stuff and she's a delight to order from. The little handbags are also made with DP in smaller prints from the pad and embellished with Basic Black and brads that match. They're layered on Whisper White square cut/embossed with a Nestabilites die as is the black layer. A black gingham ribbon "ties" it all together (sorry, couldn't resist) and some paper piercing (love how much it adds for very little work) and a black brad, and a sentiment stamped from the Sincere Salutations set finish it off. I'm liking this card, too. Great sketch and great paper--how can you go wrong? Thanks for visiting! Recipe: Stamps--Sincere Salutations (SU! ); Paper--Whisper White, Basic Black (SU! ), Urban Prairie 6 x 6 pad (Basic Grey); Ink--Basic Black (SU! ); Accessories--round tab punch, oval punch, medium oval punch, 1/16" hole punch, Cuttlebug, Nestabilites small square and small scalloped square dies, ribbon (craft store), brads (Target). This card is for the Color Throwdown challenge #17. The colors this week are black, orange, green, and purple--Halloween colors!! I was searching through my stamps and came across this one from My Favorite Things: Branch Out. It has the cutest little ghosties hanging in a tree!! 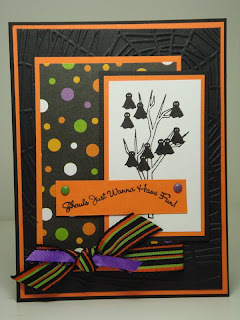 I started with a Basic Black card base and layered it with Only Orange, then another layer of Basic Black that I ran through my Cuttlebug with the Spider Web embossing folder. The next element is Only Orange with a layer of DP with all the colors and there's ribbon tied around the bottom. The focal element is stamped on Whisper White with Basic Black ink and layered on Only Orange and Basic black card stock. The sentiment is also from the Branch Out set and is stamped on Only Orange with Basic Black and attached with purple and green brads. I'm liking it! Thanks for stopping by and seeing what's new! Recipe: Stamps--Branch Out (My Favorite Things); Paper--Whisper White, Basic Black, Only Orange (SU! ); Ink--Basic Black (SU! 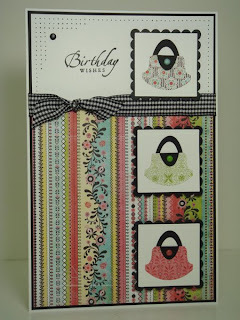 ); Accessories--Ribbon and brads (craft store), Cuttlebug and Spider Web embossing folder. This card is for the SCS color challenge 190. It's an...interesting combination of colors, LOL! But I like the way this card turned out. Another one that I pretty much worked out in my head and all I had to do was put it together. I like when that happens! I started with a Whisper White card base and layered Tangerine Tango and Pixie Pink on that. The next layer is half Kiwi Kisses and half Whisper White. Two ribbons--one orange check and one pink check--were tied around this. Across the center I attached Prima flowers in the challenge colors. I made glitter brads in the challenge colors by using an Essential Glue pad and Martha Stewart fine glitter. The sentiment is from Kitchen Sink's Never a Loss 4 Words set stamped in Kiwi Kiss. A little paper piercing on the Kiwi Kiss element balances it out, I think. This was a fun card to do. Thanks for stopping by! Recipe: Stamps--Never a Loss 4 Words (Kitchen Sink Stamps); Paper--Whisper White, Kiwi Kiss, Pixie Pink, and Tangerine Tango (SU! ); Ink--Kiwi Kiss (SU! ); Accessories--Prima flowers, Martha Stewart fine glitter, brads and ribbon (craft store), paper piercer/mat/template. This card is for the SCS sketch challenge #199. It's a great sketch and I like the way this card turned out. 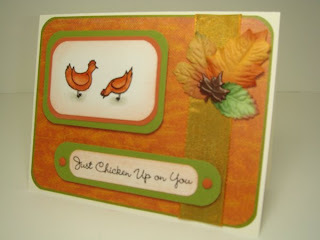 I'm STILL making Thanksgiving cards and I STILL am loving the fall colors! 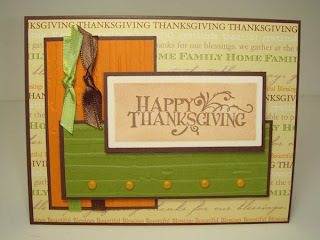 I started with a card base of Chocolate Chip and added a layer of DCWV Thanksgiving Words DP. The next element is Chocolate Chip with a layer of Pumpkin Pie which was run through my Cuttlebug using the Distressed Stripes embossing folder. I tied green and brown ribbons around this to dress it up. The next element is Chocolate Chip layered with Old Olive, also run through the Distressed Stripes folder, accented with orange brads, and adhered with dimensionals. The sentiment image is stamped with an Inkadinkado stamp in Close To Cocoa on Very Vanilla card stock and cut out using a long rectangle Nestabilities die. I left the paper in the die and sponged it with Close To Cocoa. Then it was layered on Chocolate Chip and also is up on dimensionals. Thanks for stopping by and looking! Recipe: Stamp--Inkadinkado; Paper--DCWV Thanksgiving Words, Chocolate Chip, Old Olive, Pumpkin Pie, Very Vanilla (SU! ); Ink--Close To Cocoa (SU! 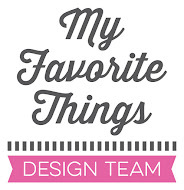 ); Accessories--ribbon and brads (craft shop), Cuttlebug, Nestabilities die, embossing folder. I simply love this fall paper. I don't think it needs much to dress it up, so I kept it simple. Another card that will be easy to mass produce. I started with a Chocolate Chip card base and added a layer of a copper metallic paper I got at Office Max, believe it or not. I used the metallic because the DP has a metallic sheen to it so the copper card stock brings it out. Then a layer of the DP, called Grateful Tree Farm by KI Memories on which I used the Ticket Corner punch. Brown brads at each corner add a little interest. The only other embellishment is a ribbon tag I cut from a Nestabilites die and stamped with a stamp from an Anna Griffith set in Close To Cocoa. The edges are sponged with Close To Cocoa, as well, and a gold satin ribbon anchors it to the card. Thanks for visiting! Recipe: Stamps--Anna Griffith set; Paper--Chocolate Chip (SU! ), copper metallic (Office Max), Grateful Tree Farm (KI Memories); Ink--Close To Cocoa (SU! ); Accessories--Cuttlebug, Nestabilities ribbon tag, ribbon, brads (craft store), 1/16" hole punch, Ticket Corner punch (SU!). We've had some remodeling done around the house and I haven't been able to stamp as much as I'd like because I've been cleaning, but I got a few cards done over the weekend. I'm still in the fall mode making Thanksgiving cards--this one is simple and would be easy to mass produce--and I probably will, since time is always short. I stamped the image on Very Vanilla card stock with Close To Cocoa and sponged the edges with it, too. I punched the corners with a fancy corner punch and layered it on Pumpkin Pie. Under that is a layer of Old Olive with the edges paper pierced. 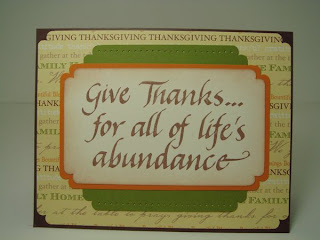 The card base is Chocolate Chip with a layer of DP from DieCuts With a View called Thanksgiving Words. All corners except the base are punched with that same corner punch. As always, I appreciate you stopping by and taking a look at what I'm up to! Recipe: Stamps--unknown; Paper--DCWV Thanksgiving Words DP, Chocolate Chip, Old Olive, Pumpkin Pie, and Very Vanilla (SU! ); Ink--Close To Cocoa (SU! ); Accessories--corner punch, paper piercer/mat/template. I love this little Fluffles stamp! He's having so much fun, LOL! I'd been wanting to do him for some time, and I'm still making Thanksgiving cards. 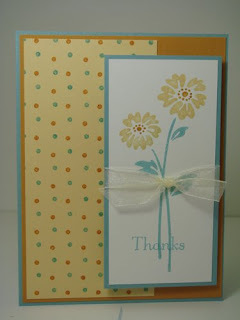 And I needed a card for Sharon Johnson's Stamp Simply challenge for this week: FLAT. No bumps. No added postage. So, Fluffles came to the rescue! I stamped the image on water color paper with Chocolate Chip ink and colored it with SU! markers and my trusty blender pen. Sponged the edges with Close T0 Cocoa and matted it on Pumpkin Pie and Old Olive card stock. The card base is Very Vanilla. I sponged these edges too, because I thought it looked to starkly vanilla without it. The other element is So Saffron embossed with my Leafy Branch Cuttlebug folder and matted on Close to Cocoa. The sentiment is stamped on Very Vanilla with Close to Cocoa using my Impression Obsession set Sentiments I. I then cut it out with a Word Window punch, and also used it on the Old Olive layer under it. Two maple leaves punched with my Martha Stewart punch anchor the ends. Thanks for stopping by! Recipe: Stamps--Fluffles Leap, Impression Obsession Sentiments I; Paper--water color paper, Very Vanilla, Pumpkin Pie, Old Olive, Close To Cocoa (SU! ); Ink--Always Artichoke, So Saffron Really Rust, Regal Rose, Pumpkin Pie, Old Olive, Close To Cocoa (SU! ); Accessories--Word Window punch (SU! 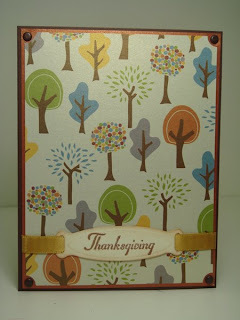 ), maple leaf punch (Martha Stewart, Cuttlebug, Lafy Branch embossing folder. OK, this was a tough one for me. The colors this week are Chocolate Chip, Creamy Caramel, Ballet Blue, and Green Galore. Hmmmm. My mojo's on vacation. What to do? Well, I dug out this DP and it has all the colors in it, and I need a baby card soon, so what the heck! I started with a Chocolate Chip card base, then added a layer of Ballet Blue, which I paper pierced all around. 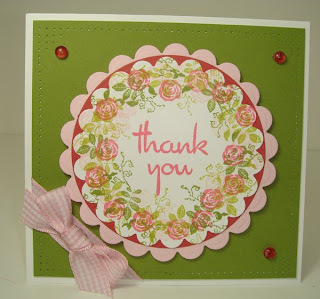 Next, a layer of Green Galore on which I used my scalloped border punch and also paper pierced each scallop. Next, a layer of the DP and I also scalloped the edge of it. I wanted lots of the paper to show, so I needed a small sentiment element. I stamped the baby image from Punches Three twice on Whisper White card stock--once with Chocolate Chip and once with Creamy Caramel. I cut the center out of the Creamy Caramel one and layered it on dimensionals on top of the Chocolate Chip image. I punched holes in the bottom one, where the little stars are, and threaded blue sheer and tan satin ribbon through the holes and secured the ribbon to the back. That's pretty much it. Not earth shattering but it'll do. Thanks for stopping by and taking a look at what I've been up to! Recipe: Stamps--Punches Three hostess gift (SU! ); Paper--Whisper White, Chocolate Chip, Green Galore, and Ballet Blue (SU! ); Ink--Chocolate Chip, Creamy Caramel (SU! ); Accessories--ribbon (craft store). Here's my card for the SCS color challenge # 189. This week's colors are Pink Pirouette, Kiwi Kiss, and Chocolate Chip. I just got the Fabulous Flowers set so I thought I'd try to use it. I used Julee Tilman's Mojo Monday # 31 sketch for my layout. When I'm stuck for layout ideas, this is the first place I go. For the focal image, I stamped the large flower image 5 times on Whisper White card stock--once in Kiwi Kiss and the rest in Pink Pirouette and cut them out in ever smaller sections. After I layered the sections up on dimensionals, I added some yellow faceted jewels for the center. My base card is Choclate Chip with a layer of Pink Pirouette. The next layer is part Bella Rosa DSP and Kiwi Kiss. The next element is Bella Rosa DSP layered on Chocolate Chip card stock. Then I added a strip of another style of Bella Rosa DSP topped with a piece of Kiwi Kiss striped ribbon. The focal image was placed on top with dimensionals. The sentiment is from My Favorite Things Sassy Sayings set and is stamped on Whisper White card stock with Chocolate Chip ink and cut out with the small oval punch. It's layered on a piece of Chocolate Chip and cut out with the medium oval punch and attached with dimensionals. Three Fresh Mown Grass Dew Drops finish it off. Thanks for stopping by and taking a look! Recipe: Stamps--Fabulous Flowers (SU! 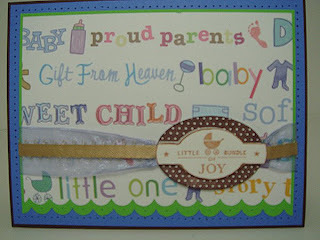 ), Sassy Sayings (My Favorite Things); Paper--Whisper White, Kiwi Kiss, Pink Pirouette, Chocolate Chip, Bella Rosa DSP (SU! ); Ink--Chocolate Chip, Pink Pirouette, Kiwi Kiss; Accessories (SU!) --Small and medium punches (SU! ), faceted jewels (craft store), Kiwi Kiss striped ribbon (SU! ), Dew Drops (Robin's Nest). More covered letters. These turn out so well and are so easy! 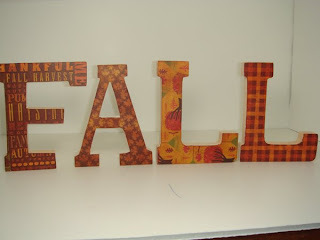 I got the resin letters at Michaels and covered them with DP, again from the K & Co. Fall Harvest mat pack. That little mat pack is so much fun to use! I smared a glue stick on the letters, slapped them down on the wrong side of the paper, cut them out with an X-acto knife, smoothed the edges with a sanding block, and sponged some Tim Holtz distress ink inTea Stain all over them. Easy peasy and cute! You can probably tell the "A" doesn't look *quite* like the other letters. It's a little different and a tiny bit smaller but it was the only "A" they had when I got these letters. The next time I get by Michaels I'll get another one if they have it. It'll only take 5 minutes to whip out another one. This card is for Sharon Johnson's Stamp Simply No Time To Stamp challenge #57. This week's challenge was NO pictures. Any stamping had to be sentiment only. Since I'm still in the fall mode, I thought of this Inkadinkado stamp that's quite simple but elegant. I stamped it on Very Vanilla in Chocolate Chip and cut/embossed with Nestabilities and layered it on Chocolate Chip. The Very Vanilla card base was layered with Chocolate Chip and craft store DP. A strip of Really Rust layered on Chocolate Chip was run across the center and paper pierced. Then I punched out lots of leaves and arranged them in each corner before adding the focal image, which is up on dimensionals. Thanks for stopping by! 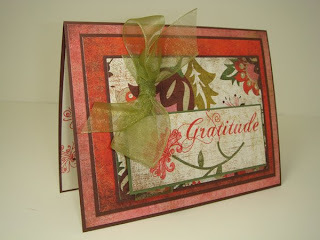 Recipe: Stamps--Thanksgiving (Inkadinkado); Paper--craft store DP. Very Vanilla, Chocolate Chip, Really Rust, Kiwi Kiss, So Saffron (SU! ); Ink--Chocolate Chip--(SU! ); Accessories--Cuttlebug, Nestabilities, Martha Stewart maple leaf punch, Magill oak leaf punch, paper piercer/mat/template. Every day on my way to and from work, I pass a tree. I look forward to seeing the fall colors on this tree every year and it never disappoints. I attempted to capture a little of that tree in this card's focal image. It's also my sample for the Color Throwdown challenge #15. This week's colors are: Kiwi Kiss, Really Rust, So Saffron, and Chocolate Chip. 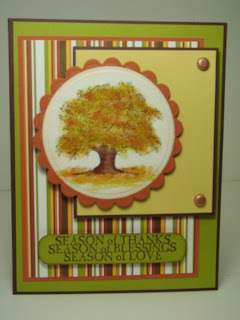 All gorgeous fall colors that made this card pretty easy to do. I used Julee Tilman's Mojo Monday Week 2 sketch to help pull it all together. I like it and I hope you do too. I started with a Chocolate Chip card base and layered it with Kiwi Kiss. The next element is a piece of craft store paper that has ALL of the challenge colors in it and was a no-brainer, LOL. That's layered on Really Rust. The next element is So Saffron layered on Chocolate Chip, accented with a couple of copper brads, and is up on dimensionals. The focal image was stamped on water color paper with a stamp from Lovely As a Tree with Chocolate chip and the trunk colored with a marker and my wonderful blender pen. (Yes, again. I love it!) I added a few branches with my marker. Then I stippled the leaves on with a stiff flat artist's brush (since I don't have a stipple brush--yet) with Kiwi Kiss, So Saffron, and Really Rust and added "leaves" on the ground the same way. I think it looks VERY realistic and I'm really happy with the way it turned out. That was cut/embossed with a Nestabilites die as was the Really Rust mat and is up on dimensionals. The sentiment was stamped with a stamp from Harvest Home on Kiwi Kiss with Chocolate Chip and cut out with a Nestabilities tag die. It was sponged with Chocolate Chip and is up on dimensionals, as well. Recipe: Stamps--Lovely As a Tree, Harvest Home; Paper--DP (craft store), Chocolate Chip, Kiwi Kiss, So Saffron, Really Rust, and water color paper (SU! ); Ink--Chocolate Chip, Kiwi Kiss, So Saffron, Really Rust; Accessories--Cuttlebug, Nestabilities, brads (craft store), dimensionals. I bought this stamp months ago with this card in mind. My brother feeds squirrels on his deck and I'm always telling him he's nuts or squirrel-y, so it's perfect for his birthday card. I'm using this card for the SCS SC198, too. I stamped my little squirrel on water color paper with Basic Black and colored him with markers and my blender pen (I really *do* love how it works!) using Creamy Caramel, Chocolate Chip, and Really Rust, and outlining him with Sahara Sand for a little dimension. He was cut/embossed with Nestabilites and matted on Really rust. The sentiment was stamped with my Making Memories magnetic set in Chocolate Chip and cut/embossed and matted in the same way. I was going to use my new Just Rite stamping block and alphabet but I realized there was no "?" in the set! Or any punctuation marks at all! What's up with that??? So, back to the drawing board and the MM set. 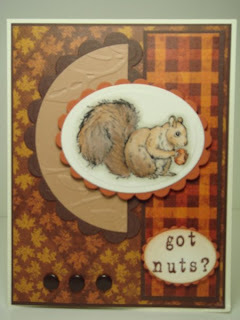 My card base is Very Vanilla with two designs from the K & Co. Fall Harvest mat pack, both layered with Chocolate Chip. The half-circle element was first embossed with my Leafy Branch Cuttlebug folder, then layered on Chocolate Chip and cut in half. I added a scalloped border on the cut side to finish it off better. Three brown brads balance the lower part and the stamped elements are up on dimensionals. This was a really fun card to make. Thanks for stopping by! Recipe: Stamps--Squirrel (Delta); Paper--Very Vanilla, Chocolate Chip, Creamy Caramel, Really Rust (SU! ), Fall Harvest mat pack (K & Co.); Ink--Chocolate Chip, Creamy Caramel, Really Rust, Basic Black; Accessories--Cuttlebug, Leafy Branch embossing folder, Nestabilities, brads (craft store), dimensionals. Another thank you card. And a card for the SCS Color challenge # 188. 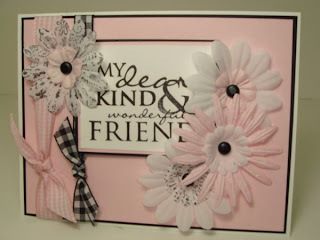 The colors for this challenge are Pink Pirouette, Basic Black, and Whisper White. The colors just called out for a girlie card and it all popped into my head and it turned out exactly like I imagined it--no struggling with this one. I love it when a plan comes together, LOL. I started with a Whisper White card base and added a Basic Black and then a Pirouette Pink layer. The focal image, from the SU! All Holidays set, was stamped on Whisper White with Basic Black ink and layered in the same manner. I took two of the flowers and stamped them with Basic Black ink and my Posy backgrounder stamp to add a little contrast. I attached all the flowers with black brads. Pink and white and black and white checked ribbons added a little balance. I love the way this card turned out. I hope you like it too! Thanks for stopping by! Recipe: Stamps--All Holidays, Posy backgrounder (SU! ); Paper--Whisper White, Basic Black, Pirouette Pink (SU! ), Ink--Basic Black; Accessories--brads/ribbon (craft store), fabric flowers (Wal*Mart), Prima flowers. I just love these little chickens from My Favorite Things' Punny Farm set. 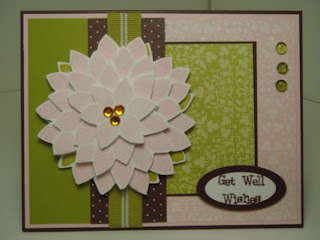 This card is for another friend with health problems--this should cheer her up a little. The card base is Very Vanilla. 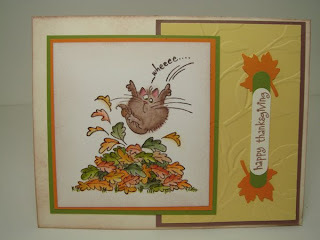 Then I've layered two DP from the K & Co. Fall Harvest mat pack (love that little mat pack!!). The chickens were colored with my SU! markers and using my blender pen. I'm really loving that little gadget! Then I sponged the edges with Really Rust and layered it on Really Rust and Old Olive card stock. It was attached with dimensionals. The sentiment is from the same stamp set and is cut with Nestabilities tag die, sponged, and layered on Old Olive card stock--I used my corner rounder on it and added rust colored brads. It's also up on dimensionals. I ran a strip of ribbon (it's really pretty in real life--gold and green threads) and attached some Prima fall leaves with a leaf brad. That's it! Thanks for visiting! Recipe: Stamps--Punny Farm (My Favorite Things); Paper--Old Olive, Really Rust, Very Vanilla (SU! ), Fall Harvest mat pack (K & Co,); Ink--Basic Black, Really Rust, Only Orange, Sahara Sand (SU! ); Accessories--corner punch, Cuttlebug, Nestabilities, ribbon and brads (craft store). I got this Inkadinkado Classic Botanicals stamp set a couple of weeks ago and thought I'd play with it a bit. It makes a great get well card, I think. I took this opportunity to try a new--for me--technique. I used my SU! markers and blender pen to do the coloring and I love it!! I started with a Very Vanilla card base, the edges of which I sponged with Ranger distress ink in Antique Linen. I added a piece of Always Artichoke card stock on which I'd pierced a border with an Ornare template that I got from Ellen Hutson's store. I colored the focal image with Brilliant Blue, Lavender Lace, Always Artichoke, Old Olive, Ruby Red, Summer Sun, and Elegant Eggplant. I cut that out with a Nestabilities die and sponged the edges as I did the card base. 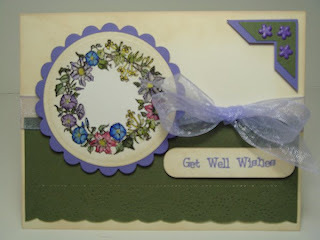 I layered it on a scalloped circle of Lavender Lace card stock cut with a Nestabilites die. The sentiment is from My Favorite Things Sassy Sayings set and was cut with a Nestabilities tag die and stamped on Very Vanilla with Lavender Lace ink and sponged, as well. I tied on a bow of sheer lavender ribbon. A double photo corner and lavender flower brads accent the right upper corner. 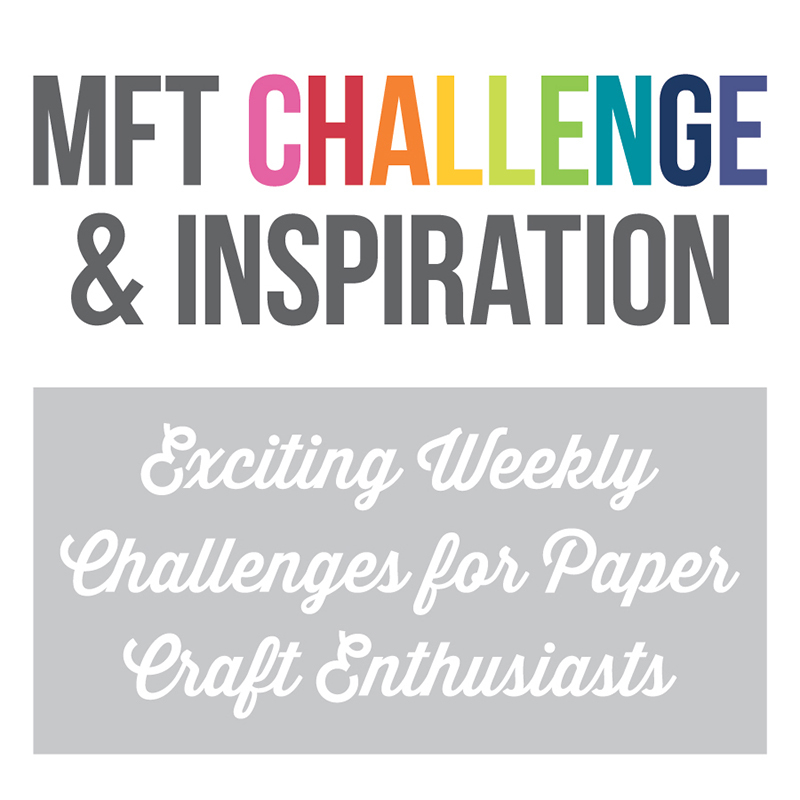 All three of the paper elements are up on dimensionals. Thanks for stopping by to see what I've been up to! Recipe: Stamps--Classic Botanicals (Inkadinkado), Sassy Sayings (My Favorite Things); Paper--Very Vanilla, Always Artichoke, Lavender Lace, watercolor paper (SU! ); Ink--Brilliant Blue, Lavender Lace, Always Artichoke, Old, Olive, Ruby Red, Summer Sun, and Elegant Eggplant (SU! ), Ranger Distress Ink Antique Linen; Accessories--Cuttlebug, Nestabilities dies, photo corner punch, sheer lavender ribbon and flower brads (craft store), paper piercer/mat/Ornare template. This card is to thank some folks for a dinner we went to recently. Since they grow super roses, I thought this stamp set would be a good one. It's a "peg" stamp set by Rubber Stamp Tapestry and the first time I've tried using it--it was really easy to do. I stamped the design on Whisper White with Regal Rose, Pirouette Pink, Blush Blossom, Kiwi Kiss, and Old Olive inks, after first cutting it out with a Nestabilities die. The sentiment is from the Kitchen Sink set, Never a Loss 4 Words. That was matted on Regal Rose card stock, also cut/embossed with a Nestabilities die, as was the next layer, from Pirouette Pink card stock. The card base is Whisper White, with an Old Olive layer that is paper pierced. The focal image is up on dimensionals. A pink and white check ribbon/bow and some Poinsettia Dew drops finish off the corners. Thanks for visiting! Recipe: Stamps--Thorny Rose (Rubber Stamp Tapestry), Never a Loss 4 Words (Kitchen Sink Stamps); Paper--Whisper White, Pirouette Pink, Regal Rose, Old Olive; Ink--Pirouette Pink, Regal Rose, Blush Blossom, Kiwi Kiss, Old Olive; Accessories--Cuttlebug, Nestabilities, paper piercermt, Dew Drops, ribbon (craft store). I've had Gina K's Botanical Dreams set for a while. 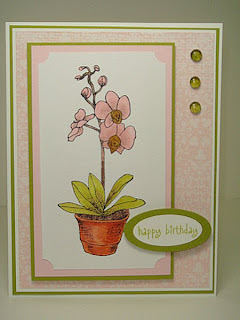 I actually bought it to make a card for a friend with the orchid stamp. She grows orchids so I thought it would be really appropriate. I water colored the image with reinkers first. Then I matted it with Pirouette Pink and Kiwi Kiss card stock. The base card is Whisper White, layered with Kiwi Kiss, then Whisper White, then Bella Rosa DSP. The focal image is up on dimensionals. The sentiment is from Sentiments I by Impression Obsession, stamped with Kiwi Kiss on Whisper White, matted on Kiwi Kiss, and is also up on dimensionals. Some Fresh Mown Grass Dew Drops was all it needed after that, I thought. Thanks for stopping by! Recipe: Stamps--Botanical Dreams (Gina K.), Sentiments I (Impression Obsession); Paper--Whisper White, Kiwi Kiss, Pirouette Pink, Bella Rosa DSP (SU! ); Ink--StazOn Graphite, Pirouette Pink, Kiwi Kiss, Close to Cocoa, More Mustard, Really Rust (SU! ); Accessories--Oval and Small Oval punches (SU! ), dimensionals, Dew Drops (Robins Nest). OK, it was a random drawing, but, I WON!! 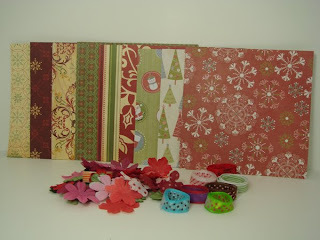 I loved playing the Jacksonbelle Embellishments contest last month, but I didn't win any prizes. HOWEVER, Lindsey threw all the names of people that sent in all four cards and drew a name to win a bag of goodies. I WON!!! Can you tell I'm so totally happy?!?! Here's what she sent--a sampling of the new Cosmo Cricket Christmas line and half of the Imaginisce. Simply gorgeous paper, ribbon, and flowers. I can't wait to create with this stuff! Thank you SO much, Lindsey--you were super generous! Now go on over and check out Lindsey's store. She's got great stuff there! This card is for the SCS sketch challenge and the No Time To Stamp Stamp Simply challenge for this week. I started with a Chocolate Chip card base, and layered a piece of DP from the Basic Grey Infuse 6 x 6 pad. Same for the next element, but with a different pattern. And again with the third, and I added a green sheer ribbon tied in a bow for this element. The focal element, from Papertrey Ink's Spiral Bouquet set, is stamped on yet another design from the collection in Ruby Red and Always Artichoke ink and is matted with Always Artichoke card stock. I like the way it turned out. Thanks for stopping by! Recipe: Stamps--Spiral Bouquet (Papertrey Ink); Paper--Infuse 6 x 6 pad (Basic Grey), Chocolate Chip, Always Artichoke (SU! ); Ink--Ruby Red, Always Artichoke (SU! ); Accessories--green sheer ribbon (craft store). This card is for my first submission to a SCS color challenge. The colors are Chocolate Chip, Tangerine Tango, and Kiwi Kiss. I think this is my all-time favorite card. Does everyone think their newest is the best? I don't always, but in this case I do. I think I'll frame it and hang it in my Girl Cave. I made it to send to some one, but I think it's staying put. The design is simple, but everything came together just right. The card base is Chocolate Chip. The next layer is from a Debbie Mumm fall mat pack I picked up at JoAnn Fabrics and I love every piece of paper in the pack--I need to go get another one. The focal image stamp is by Great Impressions and says exactly how I feel about fall. Have I ever mentioned that fall is my favorite season? It's stamped with Chocolate Chip ink and the edges sponged with that as well. The structure of the focal image is pretty clear, the the thing that really shows it up is the punched leaves and it's up on dimensionals. The oak leaf punch is by McGill and the maple leaf is a Martha Stewart punch. 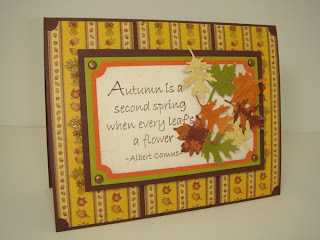 I punched each leaf four times using DP from the K & Co. Fall Harvest mat pack, another one I love. Each leaf if up on a tiny piece of foam tape for dimension. I really love this card and I hope you do too. Thanks so much for visiting and looking at my work. This Color Throwdown Challenge took me a while. This week's colors are: Taken With Teal, Tangerine Tango, and Kiwi Kiss. 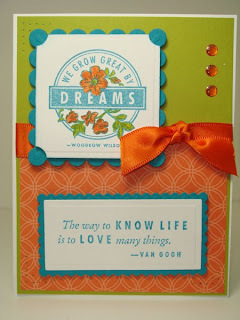 Pretty colors, and I knew I wanted to use my new Dreams du Jour stamps, but other than that, I was stumped. So I tried several (OK, lots of) different paper combinations until I came up with this and I like it. I started with a Whisper White card base. I stamped the images on Whisper White and watercolored the flowers and leaves on the main image after cutting/embossing it with a Nestabilities die. The corners were clipped with my corner punch and the edges were sponged with Taken With Teal. Then it was layered it with dimensionals on Taken With Teal which had been cut/embossed with a scalloped Nestabilities die. I layered a piece of Kiwi Kiss (love this color!!) on the card base and pierced a few holes at the top left corner. Then I added a piece of DSP from the Haiku collection and pierced a few holes in the two bottom corners. The sentiment/mat was also cut/embossed with Nestabilities and is up on dimensionals. An orange ribbon and some orange Dew Drop wannabes finish it off. I like it a lot. Thanks for visiting! Recipe: Stamps--Dreams du Jour (SU! ), Paper--Haiku DSP, Whisper White, Taken With Teal, Tangerine Tango, and Kiwi Kiss (SU! ); Ink--Taken With Teal, Tangerine Tango, and Kiwi Kiss (SU! ); Accessories--Cuttlebug, Nestabilities, ribbon and bling (craft store), paper piercer and mat. The colors for this week are So Saffron, More Mustard, and Baja Breeze. Very pretty together! I stamped the focal image using the Follow Your Dream set on Whisper White and the background with the Polka Dots backgrounder stamp on So Saffron. I used my Baja Breeze stamp pad to color the leaves and stems and Stampin' Markers for the flowers. I stamp the polka dots with Baja Breeze and More Mustard using my Stamp a ma jig to line the dots up fairly well. The rest is pretty self explanatory, I think. I tied a sheer ribbon around the focal image that matches So Saffron really well, but being sheer, it doesn't show up well in the picture. The focal image is up on dimensionals. As always, I appreciate your visiting! 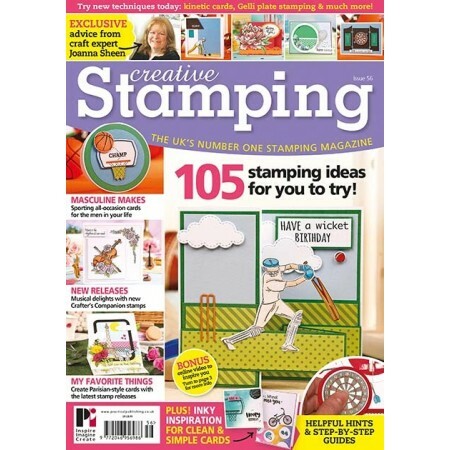 Recipe: Stamps--Follow Your Dreams, Polka Dot backgrounder (SU! ); Paper--Whisper White, More Mustard, So Saffron, and Baja Breeze (SU! ); Ink--More Mustard, So Saffron (Stampin' Markers), and Baja Breeze (SU! ); Other--ribbon (craft store), dimensionals. Cool! I just passed 1000 visits!! I doesn't take much, LOL! Thanks to all for visiting--I really appreciate it. 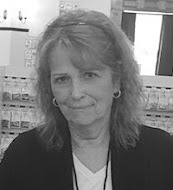 I hope you will continue to visit and recommend my blog to others if you're so inclined. At some point--maybe 5,000 visits--I'll have some blog candy to give away. I needed an anniversary card FAST! Right away I thought of the SU! set Always, so I got it out and then looked for paper. I pulled out a few things and then spied my Basic Grey Euphoria 6 x 6 pad and started thumbing through it. I love the paper I chose because Purely Pomegranate and Certainly Celery match it perfectly! Ain't it grand when a plan comes together? Anyway, my card base is Whisper White. Then a layer of the DP. 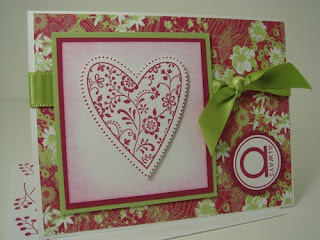 I stamped the heart from Always twice in Purely Pomegranate on Whisper White and cut one out. The other one was matted on, first, Purely Pomegranate card stock and then Certainly Celery, after having the edges sponged with Purely Pomegranate ink. I tied a green ribbon (a dead-ringer for Certainly Celery) around the card then added the focal element up on dimensionals. I stamped the "a" from the set on Whisper White, cut it out with a small circle Nestabilities die and another layer with a small scalloped circle die and embossed them both. Layered them up and attached with dimensionals. I love this card--the paper and colors make it, I think. Thanks for visiting! Recipe: Stamps--Always (SU! ), Paper--Euphoria (Basic Grey), Whisper White, Purely Pomegranate, Certainly Celery (SU! ); Ink--Purely Pomegranate (SU! ); Accessories--ribbon (craft store), Nestabilities, Cuttlebug, sponge.